Viceroy's House is a 2017 British-Indian historical drama film directed by Gurinder Chadha and written by Paul Mayeda Berges, Moira Buffini, and Chadha. The film stars Hugh Bonneville, Gillian Anderson, Manish Dayal, Huma Qureshi, and Michael Gambon. It was selected to be screened out of competition at the 67th Berlin International Film Festival. The film was released in the United Kingdom on 3 March 2017, while the Hindi dubbed version titled Partition: 1947 was released in India on 18 August 2017, 3 days after its 70th Independence Day. It was released worldwide on 1 September 2017. 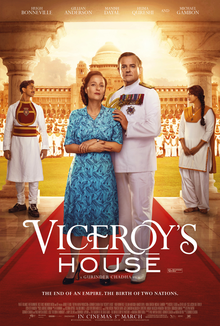 Viceroy's House is based on Freedom at Midnight by Larry Collins and Dominique Lapierre, and The Shadow of the Great Game: The Untold Story of Partition by Narendra Singh Sarila. Lord Louis Mountbatten (Hugh Bonneville) arrives at Viceroy's House in Delhi in 1947 with his strong-willed wife Edwina (Gillian Anderson) and daughter Pamela. As the final Viceroy of India, he is in charge of overseeing the dissolution of the British Raj and the establishment of an independent Indian nation. Mountbatten attempts to mediate a disagreement between the two major Indian political leaders, Jawaharlal Nehru, who wants India to remain intact as one nation after independence, and Muhammad Ali Jinnah, who wishes to establish the separate Muslim state of Pakistan. Meanwhile, Mountbatten's newly-arrived valet Jeet (Manish Dayal) encounters the beautiful Alia (Huma Qureshi), whom he had fallen in love with previously. Alia continues to spurn Jeet because he is Hindu and she Muslim; she fears that she will disappoint her invalid father Ali (Om Puri). With riots erupting across India, the British decide to accelerate the independence process. Mountbatten is intent upon a one-state solution, but with intensifying violence between Muslims and Hindus he reluctantly accepts the Partition of India. He is given only a couple months to carve out a separate state from the existing territory, with the help of an inexperienced English lawyer, Cyril Radcliffe (Simon Callow). Jeet continues to pursue Alia, until it is revealed that she has been betrothed since childhood to another man. The servants at Viceroy's House are forced to choose between staying in India or going to Pakistan. Mountbatten is enraged to find that his Chief of Staff Lord Ismay (Michael Gambon), has been working covertly to draw the boundaries of Pakistan in order to create a buffer state between the Indian subcontinent and the Soviet Union. He realizes that he has been used as a pawn and the displacement of millions of people will result. Jeet is devastated to learn meanwhile that his entire family has been slaughtered in Punjab. Although Alia rejects her fiancé when he returns to claim her, she chooses to depart for Pakistan with her father. Days later Jeet reads in the newspaper that the night train she had boarded was attacked and everyone was killed. In anger he brandishes a knife at Mountbatten, before resigning his post. With Delhi overwhelmed with refugees, the Mountbattens decide to stay on in India to assist where they can. While Jeet volunteers to help with the refugees, Alia is brought in badly injured but alive, the lone survivor of the train attack. She recognizes Jeet and shouts for him, and the two are reunited. On 30 April 2015, it was announced that Hugh Bonneville and Gillian Anderson would star in the historical drama film Viceroy's House to be directed by Gurinder Chadha, which Chadha scripted along with Paul Mayeda Berges and Moira Buffini. The film set in 1947 during the Partition of India, and the life inside the Viceroy's House, would be produced by Chadha, Deepak Nayar, and Paul Ritchie. Pathé and BBC Films would be co-financing the film. On 1 September 2015, more cast was announced including Manish Dayal, Huma Qureshi, Tanveer Ghani, Denzil Smith, Neeraj Kabi, Om Puri, Lily Travers, Michael Gambon, and Simon Callow. Principal photography on the film began on 30 August 2015 in Jodhpur, Rajasthan, India, where it was shot for eight weeks. The film was released in the United Kingdom on 3 March 2017. Chadha described the film as the Upstairs, Downstairs view of the Partition of India. She defended her film against criticisms of historical heterodoxy, saying that she was guided by Narendra Singh Sarila's 2006 book The Shadow of the Great Game: The Untold Story of India's Partition, which was based on secret documents discovered in the British Library. Pakistani poet and writer Fatima Bhutto described the film as 'a servile pantomime of partition'. Chadha in response said that "her film about India’s partition of 1947, far from ignoring the freedom struggle, celebrates it." Three additional tracks were released for the dubbed Hindi version of the film. Viceroy's House has been selected to be screened out of competition at the 67th Berlin International Film Festival on 12 February 2017. The film was released in the United Kingdom on 3 March 2017. The film was dubbed in Hindi titled Partition: 1947 and was released in India on 18 August 2017. It was banned in Pakistan. The film received generally positive reviews from critics. On review aggregator Rotten Tomatoes, the film holds an approval rating of 76% based on 41 reviews, with an average rating of 6/10. The New York Times praised the film for "cramming ample history into a compact running time without sacrificing flow or interest." The Washington Post called it "educational, if melodramatic," concluding that "the movie accomplishes a difficult task, making sense of a complicated period in history." The Guardian summed up the response to the film by saying that "Notices by film reviewers have been muted but reasonably kind", while the reaction from historians was "damning". The newspaper was very critical of the film's climax, criticizing the lack of corroborating research to back up the central claim that Pakistan was created as part of a conspiracy by Winston Churchill and the British government. ^ a b c "Programme - Viceroy's House". Berlinale. Retrieved 1 February 2017. ^ "Gurinder Chadha hopes Indians love 'Partition: 1947'". Archived from the original on 30 September 2017. Retrieved 13 October 2017. ^ "Review 'Viceroy's House' opens the door to a key era in India's past". ^ a b "Press Releases Competition 67th Berlinale - Competition and Berlinale Special - Danny Boyle, Hong Sangsoo, Thomas Arslan, Volker Schlöndorff, Sabu, Álex de la Iglesia and Josef Hader's Directorial Debut in the Competition Programme". Berlinale. 10 January 2017. Retrieved 10 January 2017. ^ a b c "Viceroy's House clip: watch Gillian Anderson and Hugh Bonneville ponder Britain's legacy in India". The Telegraph. 11 January 2017. Retrieved 11 January 2017. ^ Rohit Vats (17 August 2017). "Partition-1947 movie review: If it wasn't Lord Mountbatten then who divided India?". Hindustan Times. ^ a b c Wiseman, Andreas (30 April 2015). "Hugh Bonneville, Gillian Anderson topline partition drama 'Viceroy's House'". screendaily.com. Retrieved 5 September 2015. ^ a b Mitchell, Robert (1 September 2015). "Gurinder Chadha's 'Viceroy's House' Starts Shoot in India". variety.com. Retrieved 5 September 2015. ^ "On the Set for 9/4/15: Michael Fassbender Starts on Assassin's Creed, Margot Robbie Wraps on Suicide Squad". ssninsider.com. 4 September 2015. Archived from the original on 5 September 2015. Retrieved 5 September 2015. ^ "Partition, Mohsin Hamid, Gurinder Chadha". BBC Radio 3. 3 March 2017. Retrieved 3 March 2017. ^ Bhutto, Fatima (15 March 2017). "Fatima Bhutto on Indian partition film Viceroy's House: 'I watched this servile pantomime and wept'". The Guardian. Retrieved 3 March 2017. ^ Chadha, Gurinder (15 March 2017). "Gurinder Chadha: My film has been willfully misrepresented as anti-Muslim". The Guardian. Retrieved 3 March 2017. ^ "Partition: 1947 Movie Review". The Times of India. Retrieved 18 August 2017. ^ "Gurinder Chadha on Partition 1947: Didn't dwell on Nehru-Lady Mountbatten in film". ^ "'Partition 1947' new poster: Huma Qureshi starrer looks like a compelling watch". ^ "Viceroy's House (2017)". Rotten Tomatoes. ^ Ben Kenigsberg (2017-08-31). "Review: In 'Viceroy's House,' the Birthing Pains of Two Nations". The New York Times. Retrieved 2017-10-09. ^ Stephanie Merry (2017-09-07). "'Viceroy's House': An educational, if melodramatic refresher course on the partition of India". Washington Post. Retrieved 2017-10-09. ^ Ian Jack (2017-03-18). "The Viceroy's House version of India's partition brings fake history to screen". The Guardian. Retrieved 2017-10-09.